MANILA, Philippines — (RELEASED) Full LET RESULTS here. The March 2018 Licensure Exam for Teachers (LET) or teachers board exam results including the official list of passers, topnotchers (top 10), top performing schools and performance of schools for Elementary and Secondary levels are released online on May 23, 2018, or in forty (40) working days after the exam. 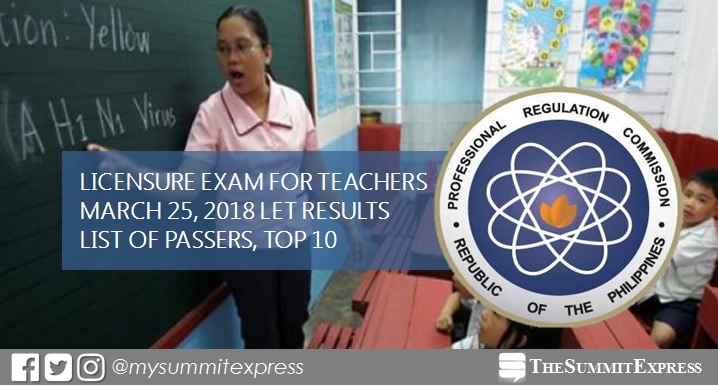 The Professional Regulation Commission (PRC) and the Board for Professional Teachers (BPT) conducted the first LET this year on March 25 (Sunday) to around 100,000 examinees in at least 20 testing centers nationwide: Manila, Bacolod, Baguio, Cagayan De Oro, Catarman, Cebu, Davao, General Santos, Iloilo, Kidapawan, Legazpi, Lucena, Occidental Mindoro, Pagadian, Palawan, Romblon, Rosales, Tacloban, Tuguegarao and Zamboanga. UPDATE: PRC announced that 13,774 elementary teachers out of 58,323 examinees (23.62%) and 22,936 secondary teachers out of 76,673 examinees (29.91%) successfully passed the LET. The teacher board exam's verification of ratings (passers, non-passers and removal) can be done online. The March 2018 LET covers two parts for Elementary - General Education (40%) and Professional Education (60%) and three parts for Secondary - General Education (20%), Professional Education (40%) and Specialization (40%). The test covered the major areas of General Education (English, Filipino, Mathematics, Science and Social Sciences), Professional Education (teaching profession, social dimensions of education, principles of teaching, education technology, curriculum development, facilitating learning, child and adolescent development, assessment of student learning, developmental reading, field study and practice teaching). The 10 specializations for Secondary level (depends on the chosen course) are the following: English, Filipino, Biological Sciences, Physical Sciences, Mathematics, Social Studies or Social Sciences, Values Education, MAPEH, Agriculture and Fishery Arts and Technology and Livelihood Education (TLE). In order to pass March 2018 LET, an examinee must get an average rating of not less than 75% and must have no rating lower than 50% in any of the tests. PRC Resolution No. 2017-1068 set the target release date of March 2018 LET result on Tuesday, May 22, 2018 or in 37 working days after the exam. The calculated total working days for PRC's target date excludes 8 Saturdays and Sundays and 5 holidays namely Maundy Thursday (March 29), Good Friday (March 30), The Day of Valor (April 9), Labor Day (May 1) and Barangay and SK Elections (May 14). A total of 58 calendar days or nearly two months was calculated. PRC Board News, our partner website for PRC exam results also said that the probable release date of March 2018 LET exam is between May 21 and 25. Earlier date of release would be possible if PRC has an improved system of checking of results. In the past 5 years for the same period, 36 days is the average number of days before the release of results for the average of 95,871 examinees. Average passing rate is 28.72%, 24.59% for Elementary and 32.11% for Secondary. This means that 3 of the 10 examinees usually passed the tests. In the March 2017 exam, results were released in forty (40) working days after the exam. A total of 5,600 elementary teachers out of 53,915 examinees (10.39%) and 18,482 secondary teachers out of 72,584 examinees (25.46%) successfully hurdled the exams. Samantha Christel Chua Gaerlan from De La Salle University (DLSU) - Manila topped the Elementary level exam with 90.60%. University of Mindanao (UM) - Davao City alum Marian Kaye Fortinez Gallego aced the board exam for Secondary level. None of the schools qualified for the top performing school list for Elementary. Meanwhile, University of the Philippines (UP) - Diliman topped the schools for Secondary. Results of the March 2016 was announced in forty-one (41) working days. PRC named 12,128 elementary teachers out of 42,739 examinees (28.38%) and 18,810 secondary teachers out of 53,090 examinees (35.43%) who passed the one-day exam. Rowena Miano Hingpit from UM-Davao bested all takers in the elementary level garnering 90.60%. Michael Prince Notorio del Rosario from Lorma College got the highest place for Secondary level, 92.00%. None of the schools qualified for the elementary level top performing school list. UPD also dominated the secondary level exam. May 1, 2018 Update: LET the countdown begin. Results are out this month! May 14, 2018 Update: Reliable source and the 'ultimate reviewer' of CBRC Dr. Carl Balita confirmed on May 14 that results will be released next week. May 17, 2018 Update: Reliable source hinted that results are out early next week (May 21-22). May 20, 2018 Update: LET Results are out THIS WEEK! May 23, 2018 Update: LET results are out TODAY!